Boost-energy. Eliminate fatigue and insomnia. How? Sleep. Tired all the time? Time to learn how to sleep tight all night. 1. The 10:00 p.m. bedtime hour. 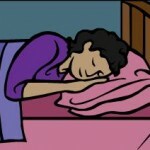 It is critical that people with fatigue and sleep problem be in bed and well on their way towards sleep by 10:00 p.m. Why? There is a dreaded adrenal gland “second wind” that kicks in around 11:00 p.m. and it launches an exhausting two to three hour cycle of insomnia. Let me say this another way so you really get it. If you don’t want to toss and turn and huff and puff in frustration until 1:00 or 2:00 a.m. you must be sound asleep before 11:00 p.m. According to Dr. James Wilson, author, Adrenal Fatigue The 21st Century Stress Syndrome, “There is something magical about the restorative power of sleep between 7:00-9:00 in the morning for people with adrenal fatigue.” Sometimes I’ll get up early – do what I need to do – and go back to bed during this time. As often as possible I’ll sleep in on weekends to tap into this magic. 3. The 2:00 p.m. Power Nap. According to Dr. Lynn Hasher this is not luxury, it is the “best time of the day” to take a break and refresh our bodies and our brains so that we can be incredibly productive for the rest of the day. (Tell that to your boss and co-workers.) So, go to your car, close the door to your office — do whatever you need to do and slip a power nap into your day. Psst. This is my problem-solving time of the day. I put out a question or request to my angels, shut my eyes and wake up fifteen minutes later with a solution. Amazing. For topics oriented to love and relationship please visit the Get Ready For Love Booklist. For mind/body health and inspiration there is the Fatigue Be Gone Reading Room. * Experiment with your sleeping “arrangements.” Do what you need to do. Rearrange your bedroom. Change your sheets. Get rid of any and all sleep obstacles even if doing so makes you feel mean and unloving. In the past three years I’ve gone from a husband, a dog and a bird to the same husband, six dogs, 3 cats and a bird. My bed has become a tad crowded. Could that be contributing to recent spats of insomnia? Last night I ran an experiment and kicked all the cats and dogs OFF the bed. I didn’t kick off my husband but he kindly took his hacking cough into anther bedroom. Anyway … I slept and slept and slept and woke up this morning like the happy woman in the Ambian commercials minus the side affects or potential health problems. So my friend, give this a whirl over the weekend and drop me a note on Monday. I’d love to hear how it works (or doesn’t) for you. This entry was posted in fatigue causes, Insomnia and Fatigue, Super Women, Uncategorized and tagged constantly tired, Eliminate fatigue and insomnia, Fatigue, Insomnia, insomnia busting tricks, power nap, tired all the time, what causes adrenal fatigue by admin. Bookmark the permalink. I’ll tell you…I do LOVE my sleep! And I sleep so much better now that I sleep ALONE. No dog, no spouse….just me. Thanks for the comment at my place! .-= kathryn´s last blog ..Thaw =-. That is interesting about the sleep and when to get it. I have gotten myself into a crazy schedule of going to bed really early and getting up early but I sleep really well most of the time even with a cat or two with me. I have found if I talk to someone right before I go to bed, then I have trouble going to sleep. Too much on my mind. .-= Marg´s last blog ..Our Entry in the St Patricks Day contest =-.